Akalya Atputharajah's experience as part of a Wilfrid Laurier University internship program in Ghana left her with an overwhelming determination to better the lives of women in the African nation. Three years after her internship concluded, the Laurier alumna has returned to Ghana to do just that. "Our goal is to ensure that families in northern Ghana have nutritious food throughout the year," says Atputharajah. "The way we're doing that is by assisting female farmers to grow more soya beans and create linkages in the market. We're also conducting financial literacy training and even nutrition training. The focus will be on enterprise development and the overall goal is to increase food security." Atputharajah arrived in Ghana in early December for a four-and-a-half month stay. While in the country, she will be working with the Greater Rural Opportunities for Women, or GROW, project, which is run by Mennonite Economic Development Associates and funded by Global Affairs Canada. It's a place she might not be, if not for her time at Laurier's Brantford campus. Atputharajah arrived at Laurier Brantford in 2010 as a first-year student in the Contemporary Studies program. While she had a strong interest in international relations and human development, she wasn't sure what direction those interests might take her. "I always had a sense of wanting to help others," says Atputharajah. "I wasn't sure about how to act on that, but being in the Contemporary Studies program offered different pathways. Human rights advocacy definitely took a front seat." It was a moment in a class taught by Robert Ame, an associate professor of human rights at Laurier, that sparked Atputharajah's interest in Ghana. As part of the class, Laurier students were able to converse via Skype with university students in Ghana. Ame grew up in the African nation and completed his bachelor's degree at the University of Ghana. Atputharajah said hearing the perspective of Ghanaian students was fascinating. When Ame later said that Laurier's Tshepo Institute for the Study of Contemporary Africa was seeking student volunteers, Atputharajah jumped at the opportunity. "I always had a sense of wanting to help others. I wasn't sure about how to act on that, but being in the Contemporary Studies program offered different pathways. Human rights advocacy definitely took a front seat." "After the first event I didn't stop volunteering and was eventually offered a job as an administrative assistant," she says. "Listening to the research ideas of Tshepo Institute members and hearing about their experiences in Africa really got the ball rolling with my interest. Soon after, the opportunity arose to go to Ghana and I took it." Laurier has been sending up to eight undergraduate students from the Human Rights and Human Diversity and Global Studies programs for summer internships in Ghana since 2012. Students stay at the international hostel at the University of Ghana and work with local non-governmental organizations. Andrew Robinson, Human Rights and Human Diversity program coordinator at Laurier, says the internships allow students to see realities on the ground and enhance what they learn in the classroom. "For many students, it really confirms their interest in international issues and further energizes and gives a focus to their passion," says Robinson. "A lot of the students really develop a connection to the people and the place. Some of them find that three months is not enough time and they want to stay even longer." Atputharajah travelled to Ghana with five other students from Laurier's Brantford and Waterloo campuses following her third year of studies. The six students split into groups of two, with the groups working at three different organizations in Ghana. During her three-month trip as part of the Laurier program, Atputharajah worked with the Ark Foundation, a women's rights and advocacy organization that operated the only women's shelter in Ghana, a country of about 27 million people. While working with the Ark Foundation, Atputharajah conducted and promoted research designed to share information, empower women and celebrate their successes. "My skill was in research and I did a lot of work that paralleled my interests," says Atputharajah. "In the last month, I conducted an in-house training session at the organization for an intimate partner violence and forced migration campaign." When Atputharajah returned to Laurier for her fourth year of studies, it was with a new determination. "Going to Ghana solidified my desire to work in international development," she says. "I realized that I wanted to plan a path where I could do this for a living, make a career out of it. I didn't want it to be an internship that was a one-off experience." 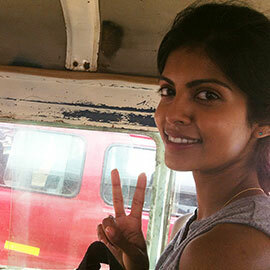 Part of Atputharajah's desire to work in international development is based in her family history. Of Sri Lankan heritage, Atputharajah's mother arrived in Canada just before she was born, and her father soon after. "I'm Tamil and both my parents came to Canada as refugees," she says. "They were running from a civil war. Just within my own family and our experiences, I've seen what support for human rights can do for people and on the flip side what human rights violations can do to people and their families." An estimated 80,000 to 100,000 people were killed during Sri Lanka's more than 25-year civil war, which came to an end in 2009. After four years at Laurier, Atputharajah graduated with a degree in Contemporary Studies. She began studies at Ryerson University the following year and recently graduated with a master's degree in immigration and settlement studies. Throughout her time at Ryerson, she kept an eye toward future opportunities that might allow her to return to Ghana. Through Global Affairs Canada, she found the GROW project. "Fostering a sustainable relationship with a country is an important part of international development," says Atputharajah. "The old way of doing international development was putting a Band-Aid on something and leaving. I don't want to be the person who just jumps in there for a few months and never sees if anything changes." As for what comes next, Atputharajah says she is hoping to work toward her PhD. She also intends to continue and expand upon the international development work she has become so passionate about. "I hope to not only go back to Ghana, but hopefully go to work in other countries in the future," says Atputharajah. "For me, this is definitely going to be a life-long effort." In 2015, Laurier built on its Ghana internship program and strengthened ties with the University of Ghana by forming the Laurier-Ghana Partnership for Human Rights and Social Justice. Laurier received more than $400,000 through the Canadian Queen Elizabeth II Diamond Jubilee Scholarships program to initiate the partnership. The partnership sees eight undergraduate students participate in internships in Ghana each summer, eight graduate students from Laurier study for a term in Ghana and eight graduate students from Ghana spend a term at Laurier, with a Ghanaian student completing a fully funded PhD in Social Work at Laurier. The project is led by Human Rights and Human Diversity faculty members Robert Ame and Andrew Robinson with support from Laurier International.